Tevin Farmer (28-4-1, 6 KOs) will be looking to defend his IBF Super Featherweight title for the third time when he takes on the undefeated Jono Carroll (16-0-1, 3 KOs). These two will square off at the Liacouras Center in Philadelphia Pennsylvania. Farmer is the definition of “Philly Tough”. Following a knockout loss at the hands of Jose Pedraza way back in 2012 Farmer hasn’t lost since reeling off an incredible 21 wins in a row. He doesn’t seem to be slowing down either. In his last contest he easily defeated Francisco Fonseca to keep his streak going. Farmer has long been calling for a showdown with fellow champion, WBA title holder Gervonta Davis. Although that bout has yet to come to fruition there is growing optimism that it will come about soon. 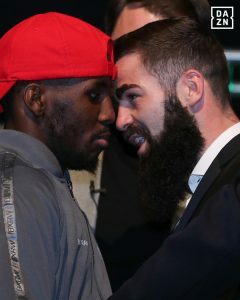 If Farmer wants to keep that contest alive, he will first have to get through Jono Carroll. The Ireland born fighter has spent his career fighting in his hometown of Ireland and in the United Kingdom. This will be his first fight on American soil. For those unfamiliar with the style of Carroll, he is an excellent boxer who comes forward and lets his hands go early and often. He is also slick on the defensive side as well as enjoys making his opponents miss and pay. Farmer coincidentally enough has a very similar style but mostly relies on his defense to get the job done. Both fighters aren’t known for their power as they have a combined 50 fights between them but only 9 knockouts. The game plan for both men will be simple, hit and don’t get hit in return. At this stage in Farmers career it isn’t just about simply winning fights but it is also about looking as dominant as possible as well. This contest will undoubtedly be the biggest in the career of Carroll as he will be looking to place Farmers world title around his waist. The odds are seemingly stacked against Carroll as not only is Farmer a terrific fighter but he will also have the support of his hometown crowd behind him. Carrol won’t be the only one on this card looking to upset the odds as WBO Lightweight champion Rose Volante (14-0, 8 KOs) will look to defeat one of women’s boxing rising stars in Katie Taylor (12-0, 5 KOs). The winner of this contest will lay claim to three of the four major titles as not only will Volante’s WBO title be on the line but so will Taylor’s WBA and IBF titles as well. The pressure to perform will rest on both women but more so Taylor as she has been dubbed the next great woman’s boxer. This amount of pressure is nothing new to Taylor as she has thrived under these circumstances. In 2012 she dominated the Olympic Games and brung home a gold medal in the process. After turning pro in 2016 she quickly won a world title in just her seventh pro fight as she won the WBA belt. In her ninth fight she would add the IBF title to her collection. To say that she is an accomplished boxer would be an understatement. She has all of the necessary tools needed in order to continue to dominate the sport. With that being said however, she will have a very difficult time with Rose Volante come fight night. The current WBO champion is a skillful fighter who has plenty of power. In her two ring appearances in 2018 she stopped both of her opponents, needing no more than five rounds to get the job done. This won’t be a cake walk for Taylor by any means. Tevin Farmer and Jono Carroll headline this great card but both Katie Taylor and Rose Volante will absolutely put on a show.